Although gum disease is terribly pervasive, it’s also preventable. Conservative estimates report that up to 80% of people unknowingly have some amount of chronic gum disease. What’s worse is that this disease is responsible for up to 70% of adult tooth loss. Part of the problem is that the early signs of gum disease are both silent and serious. Most of the time, patients are unaware of gum disease. Gum disease requires a dentist’s trained eye to detect, treat, and arrest the tell-tale gum inflammation and infection. However, once arrested, you can prevent gum disease from recurring, simply by developing healthy hygiene habits. 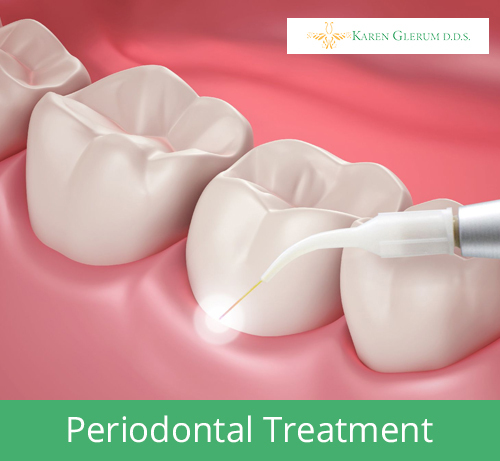 Several factors contribute to periodontal disease: plaque build-up, heredity, and lifestyle choices. By far the most common and controllable factor is bacterial plaque, the sticky, colorless film produced by normal oral bacteria. Unhindered, they release toxins that break down the natural fibers holding your gums to your teeth, allowing even more bacteria and toxins to invade. Over time, this process can permanently damage or destroy the affected tooth, tooth root, and even the jawbone! Further, plaque deposits quickly harden into calculus or tartar, a rough, porous, gum-irritating substance that brushing will not remove. Dental tartar has been compared to barnacles on the side of ships at sea, and it is just as hard to remove! Tartar’s irritating effects can be imagined as having a splinter in your finger: your finger gets red and swollen. Your finger won’t heal until the splinter is removed. Besides poor oral health habits, your poor lifestyle choices can affect your body’s ability to fight infection or increase irritation in the gum tissue area. Poor nutrition, poorly managed stress, leukemia, AIDS, and diabetes all reduce your body’s natural ability to fight periodontal disease. Smoking and chewing tobacco greatly irritate the gum tissue, setting it up for disease. And finally, some people are simply born with a low resistance to gum disease. All of this explains why we carefully check for the warning signs at every visit: red, swollen, tender, or bleeding gums, gums pulling away from teeth, loose or separating teeth, pus between the gum and tooth, persistent bad breath, bite changes, and/or a change in the fit of partial dentures. We also measure for gum “pockets”, those spaces under the gum that indicate how severe the disease is. Common gum disease symptoms are overlooked by most people, making regular dental exams even more important.